The Changing of the Guard is an iconic British tradition. Here’s the scoop on the history of the ceremony plus the best time to arrive and where to stand to watch the proceedings. 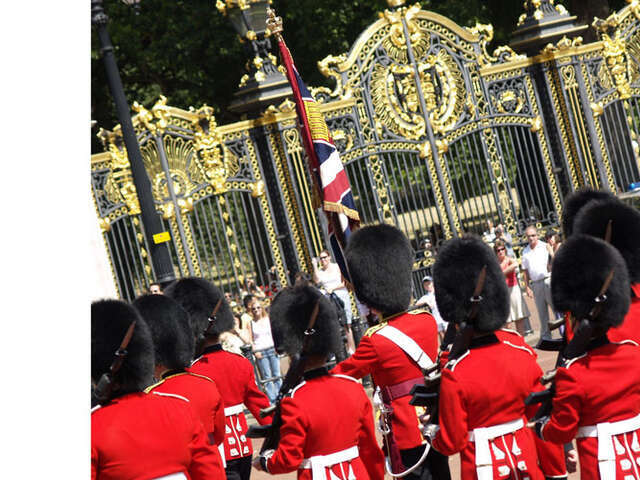 The Changing of the Guard is an iconic British tradition. It’s truly a site to see with its perfectly turned out guards, precision drills, marching bands and lots of pomp and pageantry. It happens every day at precisely 11:30am when the old guard hands the responsibility of protecting Buckingham Palace to the new guard, all the while making quite a show of it. Here’s the scoop on the history of the ceremony plus the best time to arrive and where to stand to watch the proceedings. Since the days of Henry VII, elite soldiers have been charged with protecting the King or Queen. In fact, it was Henry VII who made the Royal Body Guard a permanent institution that still exists today. They may look like performers to some, but The Royal Guard Regiments are comprised of very highly trained soldiers and officers and are one of the oldest units of the British Army, bravely going to battle for their country since the 1600’s. Originally, the proceedings took place at the Palace of Whitehall. When the court moved to St. James’s Palace it commenced there. When Queen Victoria moved to Buckingham Palace in 1837, the Guard did not move there, but sent a detachment to protect the palace instead. Today, it is still as it was in the days of Queen Victoria. You can tell when the Queen is in residence by the number of guards (more when she’s at home, fewer when she’s not) and if the Royal Standard is flying high above the palace. Even though the action takes place starting with the Old Guard leaving St. James’s Palace at 10:43am and the New Guard leaving Wellington Barracks at 10:57am, a good amount of the action takes place at Buckingham Palace. If you want to see lots of action, the best place to stand is at Buckingham Palace. Huge crowds gather there, so you want to be there by 10:30am at the latest. Try to find a place next to the railings in front of the Palace. Another good view of the proceedings can be had from the steps of the Victoria Monument. There, you’ll catch the Guards and Bands coming and going as well as the Household Cavalry. If you prefer to avoid the crowds, you’re in luck! The ceremony takes place between three different locations: Buckingham Palace, St. James’s Palace and Wellington Barracks. Time your spot correctly and you’ll get to see the soldiers passing through on their way to and from each location. The Changing of the Guard is a lot of fun and a great favourite amongst visitors and locals alike. If you’re lucky, once the ceremony has concluded, you may be able to get a photo standing next to one of these magnificent soldiers.